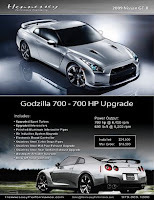 Hennessey Performance has started to offer two upgrade packages for 2009 Nissan GT-Rs. 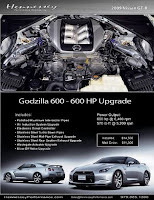 The 600 hp package called Godzilla 600 costs $14,500 installed and is good for a claimed 600 hp and 570 lb-ft of torque. The 700 hp called Godzilla 700 package costs $24,500 includes upgraded sport turbos and claims 700 hp and 630 lb-ft of torque. Both packages have exhaust system modifications, a boost controller, intercooler pipes , wastegate actuator upgrades , and an air induction kit upgrade They don't mention engine management, fuel system, or fuel injector upgrades. They make no claims on transmission upgrades, or clutch upgrades. I would like to see some actual dyno runs, and proof of horsepower claims.